Lynne Johnson, the owner of Sauk Creek Alpacas, has been breeding alpacas for almost 20 years. After seven years agisting her growing herd, she bought a five-acre farm located just 10 miles south of Madison, Wisconsin, in 2007 and became a hands-on alpaca breeder. In 2014, she retired from her position as director of communications at the University of Wisconsin Foundation, sold the farm and downsized to eight alpacas, which she moved north to Green Lake. These eight have since been sold to Mesa Trails Alpacas in Dousman, Wisconsin. Today, there is one silver grey alpaca who is boarded at Token Creek Alpacas in Evansville, WI. Ellie is due with a Tsunami cria the end of September, 2018. Over the years, Sauk Creek Alpacas built a herd of fine quality huacaya alpacas, with some of the best known bloodlines in North America--Peruvian Accoyo Caligula, Hemingway, PPeruvian Accoyo Felix, NWA LTD Accoyo's Goldsmith, Conan, PPeruvian Emilio, PPPeruvian Royal Fawn, Snowmass Royal Star and PPeruvian Guellermo. Operated with the highest of integrity, Sauk Creek Alpacas breeds alpacas with dense fine fiber, calm dispositions and rock-solid conformation. Our efforts are rewarded annually in the show ring with blue ribbons and color championships. 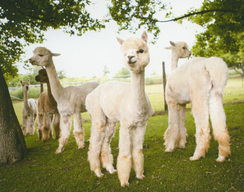 The alpacas of Sauk Creek are registered with the Alpaca Registry, Inc. We are members of Alpaca Owners Association, Alpaca Registry, Inc., Midwest Alpaca Owners Association, Upper Midwest Alpacas and the Great Lakes Alpaca Breeders Association. Long active in the alpaca community, Lynne is one of the original founders of the Great Midwest Alpaca Festival, which had a successful 11-year run at the Veterans Memorial Coliseum at the Alliant Energy Center in Madison. A former journalist, she spent much of her career in the newspaper business in Wisconsin and in Orange County, California, where she was entertainment editor for a local daily newspaper and later executive editor of the Orange County Business Journal. She also owned and operated a public relations firm prior to her return to Wisconsin in 1990 when she joined the University of Wisconsin Foundation's communications staff. She has published articles on the business of breeding alpacas and conducted seminars on marketing.